Rich and comforting this creamy mushroom soup topped with crunchy croutons is the perfect winter-warmer. 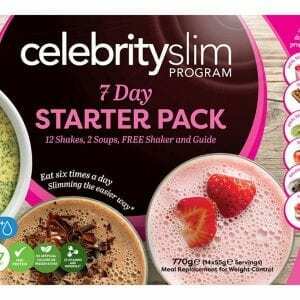 Each Celebrity Slim Meal Replacement Soup sachet contains a nutritionally balanced combination of protein, carbohydrates, fats, vitamins and minerals, to sustain your energy while you lose weight. 1. Empty the contents of the sachet into a mug or bowl. 2. Add 200-250ml of hot but not boiling water and stir well. (See individual sachet for exact quantity of water to add). 3. For Spicy Chicken Noodle, cover with a plate or lid and leave to stand for 3 minutes before consuming. Always take care when using hot liquids. 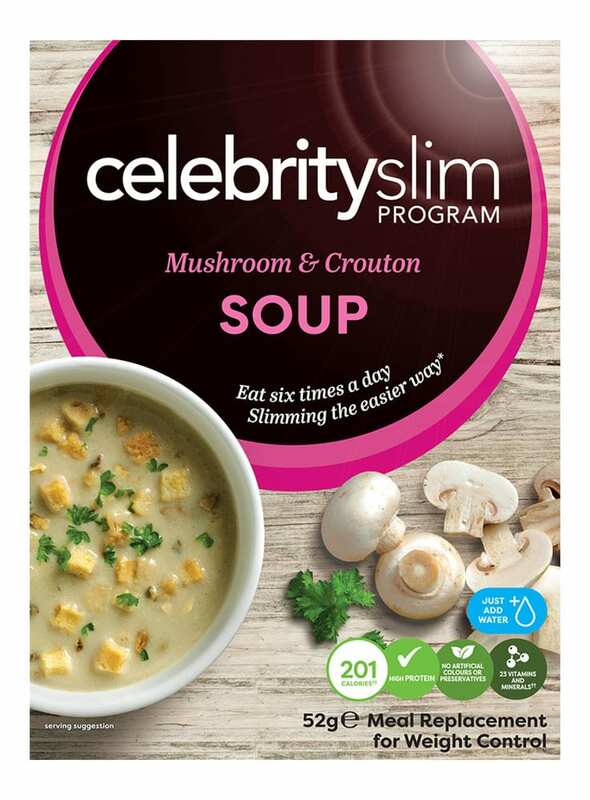 DO NOT use the Celebrity Slim Shaker for soups. Skimmed Milk Powder, Pea and SoyaProteins, Croutons (Wheat Flour (Gluten), Palm Oil, Salt, Rapeseed Oil, Yeast), Vegetable Oil prep. (Soya Bean Oil, Glucose Syrup, Skimmed MilkPowder, Maltodextrin, Refined Coconut Oil, Milk Protein, Stabiliser (Potassium Phosphate), Emulsifier (Soya Lecithin), Antioxidants (Ascorbyl Palmitate, Alpha Tocopherols), Oligofructose (Chicory Root Extract), Thickeners (Modified Corn Starch, Guar Gum, Xanthan Gum, Sodium Alginate), Dehydrated Mushroom (4.4%), Flavourings (Milk), Acidity Regulators (Potassium Chloride, Potassium Citrate, Magnesium Oxide), Salt, Stabiliser (Magnesium Phosphate, Tricalcium Phosphate), Vitamins and Minerals mix (vitamin C, Ferric Pyrophosphate, vitamin E, Niacin, Zinc Oxide, Copper Gluconate, Pantothenic Acid, Manganese Sulphate, vitamin B6, Riboflavin, Thiamin, vitamin A, Folate, Potassium Iodide, Sodium Selenite, Biotin, vitamin D, vitamin B12), Onion Powder, Yeast Extract, Hydrolysed Vegetable Protein (Gluten), Spices (Celery), Garlic Powder, Anti Caking Agent (Silicon Dioxide). Allergens in bold. Made in a factory also sulfites. Energy 1624kJ, 387kcal, Fat 12.1g, of which Saturates 3.4g, Carbohydrate 34.6g, of which Sugars 18.3g, Fibre 6.2g, Protein 31.7g, Salt 3.9g, Vitamin A 625μg, Vitamin D 6.0μg, Vitamin E 9.4mg, Vitamin C 64.2mg, Thiamin 0.9mg, Riboflavin 1.5mg, Niacin 14.3mg, Vitamin B6 1.3mg, Folic Acid 163μg, Vitamin B12 3.0μg, Biotin 41.0μg, Pantothenic Acid 5.3mg, Potassium 1365mg, Calcium 538mg, Phosphorus 739mg, Magnesium 268mg, Iron 10.2mg, Zinc 7.1mg, Copper 0.8mg, Manganese 1.6mg, Selenium 43.5μg, Iodine 118μg. Energy 845kJ, 201kcal, Fat 6.3g, of which Saturates 1.8g, Carbohydrate 18.0g, of which Sugars 9.5g, Fibre 3.2g, Protein 16.5g, Salt 2.0g, Vitamin A 325μg, Vitamin D 3.1μg, Vitamin E 4.9mg, Vitamin C 33.4mg, Thiamin 0.5mg, Riboflavin 0.8mg, Niacin 7.4mg, Vitamin B6 0.7mg, Folic Acid 85.0μg, Vitamin B12 1.5μg, Biotin 21.3μg, Pantothenic Acid 2.8mg, Potassium 710mg, Calcium 280mg, Phosphorus 384mg, Magnesium 139mg, Iron 5.3mg, Zinc 3.7mg, Copper 0.4mg, Manganese 0.8mg, Selenium 22.5μg, Iodine 61.0μg. This product is a meal replacement for weight control. This product is useful for the intended use only as part of an energy restricted diet and other food is a necessary part of the diet. This product is a formulated meal replacement. It is not to be used as a total diet replacement and should be used in conjunction with a diet and exercise program. Always check with your GP that the level of exercise planned is safe for you, especially if you haven’t exercised for some time. For exercise tips please visit www.celebrityslim.co.uk. If you have any medical conditions or are taking any medication, please contact your Healthcare professional before starting on the program. Not suitable for pregnant or breastfeeding women or children under 16 years of age. It is important to maintain an adequate daily fluid intake when using this product and to follow these directions.